New Delhi, Nov 23 (IANS) Navjot Kaur Sidhu, the wife of cricketer-turned-politician Navjot Singh Sidhu, and former hockey Olympian Pargat Singh will join the Congress on November 28, Congress Punjab unit chief Captain Amarinder Singh said on Wednesday. 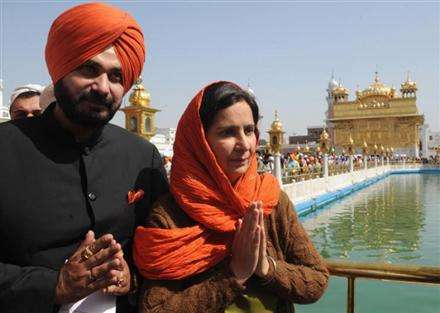 Navjot Singh Sidhu is likely to come to Delhi on Thursday to meet the Congress high command on the issue of his wife's entry to the party, informed sources said. "I am pleased to announce that Navjot Kaur Sidhu and Pargat Singh will formally be joining the Congress on November 28," Amarinder Singh tweeted. All India Congress Committee incharge of Punjab Asha Kumari told IANS: "Navjot Kaur Sidhu and Pargat Singh expressed their desire to join our party. They came and met Congress Vice-President Rahul Gandhi today (Wednesday) and the High Command accepted their request." Navjot Kaur Sidhu had resigned from the Bharatiya Janata Party on October 8. She represents Amritsar East constituency in the Punjab assembly. Pargat Singh is a former hockey player and was earlier associated with the ruling Shiromani Akali Dal (SAD) in Punjab. He represents Jalandhar Cantt constituency in the assembly. The announcement came amid speculation that Navjot Singh Sidhu will also join the Congress in the coming days.